I featured this J. Crew Polynesian Floral print shell about a month ago on my blog here, where I also chronicled my "epic" quest to track down the shirt. Today, I am keeping pretty much the same silhouette from the first time I styled it, but I changed a few things up. For example, I swapped out the red pencil skirt for a striped one. I never would have thought of pairing stripes with the shirt, but when I saw Alice from Happiness At Midlife rock the top with striped pants on her blog, I knew I had to do my own version of the look. I also changed up my bag from a clutch to a turquoise tote (an early birthday present from my husband), and went for silver shoes. So as you can see, the look is just "tweaked" a little from the last time around. This shirt truly lends itself to so many options when it comes to styling. Since I am starting to think about transitions and getting ready for fall (even though we don't really have a fall here in SoCal), I hope to maybe style it with some colored skinny jeans or pants and a blazer when the cooler weather comes. (Cold weather rarely comes to Los Angeles, so I'll settle for "cooler" weather.) Stay tuned! Thank Kim! Yes, my husband definitely didn't pick out my bag! I love that top with the striped skirt! 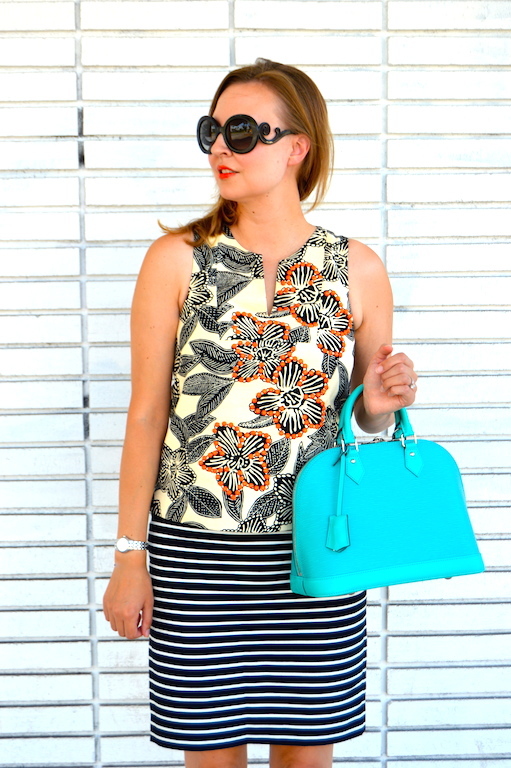 Awesome print mixing! Thank you! 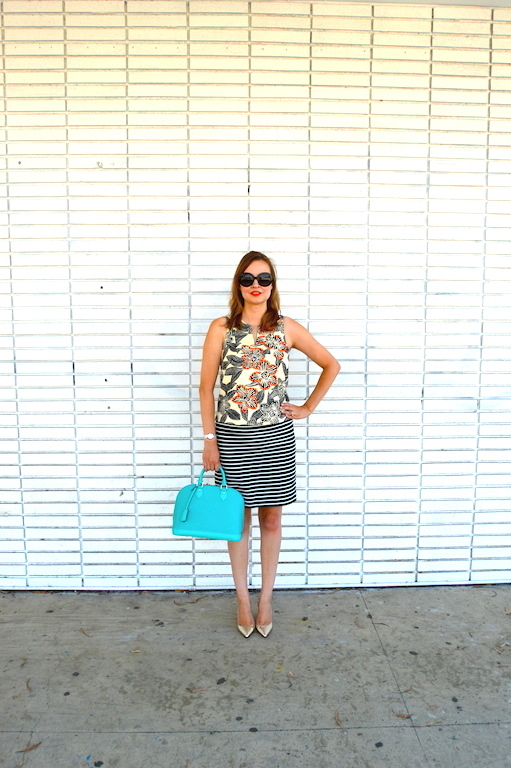 It's always fun to mix prints with stripes. So many fun colors and patterns in this outfit. I really need to get a turq bag! Thank you Carrie! I find that the turquoise really goes with a lot in my wardrobe. It definitely got a lot of use this summer! This top is one of my favorite purchase this year! 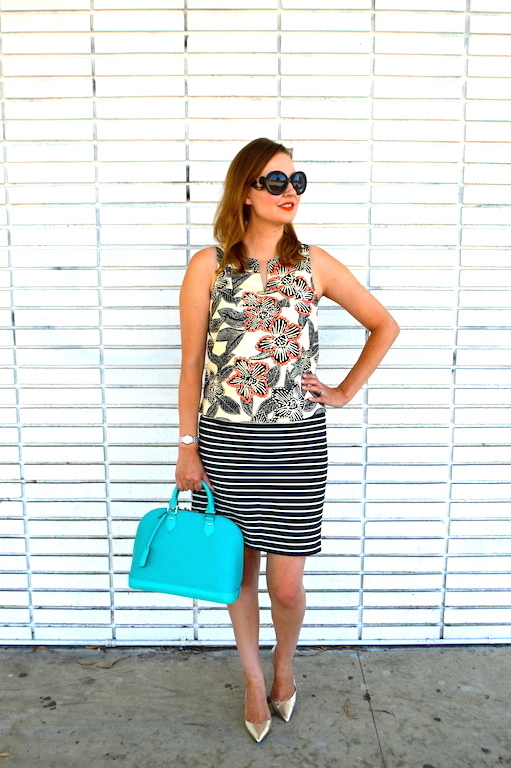 I love the pairing with the beautiful turquoise purse! Yes, I can definitely see why it is one of your favorites! I am so glad I got it before it sold out. Thanks for hosting! Thank you! I thought it would be fun to add a little color to a primarily black and white look! Love that you mixed prints this year yet kept it so clean, pretty and monochromatic at the same time. I need that top. Is it on sale yet? P.S. Do you have a Pinterest account Katie? Yes, the top has been on sale for a while, although I am not sure if it is still available. You might be able to find it on ebay. I do have a Pinterest account, although it's sort of a mess of things! (I guess that's the point with Pinterest!) Anyway, I followed you on Pinterest just now.